Can you believe this is the last running post I’ll share in November? I honestly can’t remember another November that went so fast. I don’t really mind, though- the sooner this month ends, the sooner the holidays will be here! Speaking of holidays, last week included a Thanksgiving day race, along with several other runs that were mostly stroller runs. I’m on vacation, so if I want to run, most times there’s a stroller involved. After the 5 miler … fun fact: during the race, we had to stop for ambulances to drive by. I didn’t mind stopping to catch my breath, but I did wonder what my time would’ve been otherwise. Did you do a Thanksgiving race? Have you ever had to unexpectedly stop in the middle of a race for an emergency vehicle or other reason? See what I mean? I didn’t even include work, which took up a few hours of my weekend as well! Good thing I like being busy. Friday night started out with a date night! B and I went to the new Southern Tier and grabbed drinks. I of course had to get a Pumpking- they had a coffee stout kind that was amazing! After that, we were off to the Indians game! This is our 9th game of the season together. It was just the 2 of us at the game for the first time all season! It was nice to just relax and enjoy the game. Saturday morning FW and I let LM and B sleep in, so we started off the morning by making muffins! Later in the morning, we took a walk to the nature center. It was packet pickup for a race we had planned for Sunday. FW enjoyed checking out the turtle. And then we went fot a short nature walk. That afternoon included some cookie baking. And then we took said cookies in our wagon and headed to our block party! Everything was really kid friendly. FW loved the chalk. And the donut game- you had to try to eat it on the string without any hands! There was also a game that involved eating whipped cream with no hands. Not a bad block party, right? Sunday morning started early with a 5k race around the Shaker Lakes. It was my first race pushing the stroller the entire time – B pushed LM and I pushed FW – and it was fun! My goal was to do under 10 minute miles and we did it – so I was happy. In the afternoon, we headed to another Indians game. This time, with FW. After the game, it was time for dinnernat B’s parents’ house. We celebrated his birthday with his favorite- steak for dinner and chocolate cake with chocolate frosting for dessert. Did you get to do any races this weekend? Well, just as last week was a GREAT week for running, this week was not so great. It ended alright, but I started off the week with a cold that – combined with 2 kids and little sleep – knocked me out! Often times, I’ll try to power through a run when I’m sick. This week, however, all I wanted to do was sleep! I finally felt a little better Wednesday, but LM woke up at 2:30 a.m. (after also being up at midnight with me) and just wouldn’t go back to sleep until nearly 7 a.m. (and FW got up at 6:30). I decided that running on 2.5 hours of sleep and being sick wasn’t the best idea, and thus the low mileage this week. It wasn’t all bad this week, though – I got to do my first race since LM was born! Having only been cleared to run for a little over 4 weeks, I had no real time goals in mind and just wanted to run the whole time. I’m proud to say not only did I run the entire time, but it was my fastest run in ages! Do you prefer running at night or morning? Have you done a nighttime race? Weekend Recap: Cleveland Marathon Weekend! Well, Cleveland Marathon weekend has come and gone. It’s always such a great weekend and I love all the events that I get to take part in – thanks to being an ambassador – that I’m a little sad it’s over. I’ll start by saying that I was having mixed feelings about this year’s events. Why? Being 39 weeks pregnant (due date=THURSDAY), I was unsure of my ability to run/walk. Sure, when I signed on in the fall, in my head I thought, “If anything I can at least walk 6 miles – that’s nothing.” But as I got further and further along, I realize that walking a 10K with extra weight, a baby in my belly pushing on my bladder, and little sleep (yay third trimester), may not be what I wanted to do at this point in my pregnancy. BUT I’m so glad that I did. I really do love running and even when it’s not so comfortable (a.k.a. NOW), it’s great to be part of a fun race with fun crowds and a great location – CLEVELAND!). In any case, my weekend started early with fun marathon events. First, the Expo! Cari and I headed to the Expo and had to take our annual race weekend photo. A little different than last year’s photo, huh? Then, it was time for the pre-race reception/dinner. As a race ambassador I get to get dressed up and mingle with all the VIPs (sponsors and elite runners!) in town the night before the race. The event always has good food, live music, a great location – it’s at the beautiful Galleria – AND I get to see my fellow ambassadors! Saturday morning started early (but not as early as Sunday …) with our alarm going off to get ready for the Cleveland Marathon 5k. This is my third year participating in the race’s Challenge Series, which involves running an event on Saturday (either a 5k or 8k) and then an event on Sunday (either a 10k or full/half marathon). The race was fun and not as painful as last weekend’s 5k for some reason. Oh, and B wore FW in a backpack and RAN ALONG SIDE OF ME. I still can’t believe he did that. After the race, we hung around for a little and checked out some of the event they had going on. The real event is Sunday, but they had some tents and things set up. Including a place that had THESE things – FW ran over to it and immediately started playing. Let’s just say I know what he may need for his birthday! Then, picked up some bagels from our favorite local bagel shop. They had piping hot apple cinnamon bagels right from the oven, which was a perfect post-race meal. Then, we hit up La-Z Boy. We had ordered a chair for our nursery back in March, but for some reason it was delayed and we didn’t find out until this past week. So, we had to go back in the store and pick out a new one so it would arrive in time – hopefully it’s delivered this week before Baby #2 arrives! We played it low key in the afternoon. It involved a walk outside (FW loved splashing in all the puddles), and B made us pasta for dinner (my request – a perfect pre-10k meal!). Sunday morning started even earlier – my alarm got me up around 5 so that we could have enough time to get ready, get FW up, eat something and head downtown before the 6:30 road closures. Despite the weather forecast looking picture perfect, it rained steadily as we drove downtown, as we walked to the start and as we started the race. Despite being wet, I was happy that it stayed in mild temps and I didn’t overheat (which happens a lot faster at this point in my pregnancy). I’ll be sharing a full race recap, but all in all the 10k went well. Was it a lot harder on me than the 5k? Yes. Was I sore before and during and after the race? Yes. But did I feel super proud for having completed a 10k at 39+ weeks pregnant? You bet. And FW and B kept me company throughout the entire route, which made it even better. After the race, we got some hot coffees. Mine was delicious (or I should say is delicious – I still have some leftover :)) – it had honey and cinnamon in it! Then, we met up with Dave and Anson for or usual Happy Dog lunch. I got a veggie dog with veggie chili and an egg on top – it was really good! And since we were in the neighborhood, we picked up a few groceries as well. Admittedly, I pretty much crashed after that excursion. I’m not typically a big napper, but when FW took his afternoon nap, I took a short one as well. My body was TIRED from the 10k – I felt like I had run much more! That night, we finished up the day with dinner at B’s parents house. As always, a good end to a quick weekend. And FW always has a good time playing with his cousins, aunts and uncles. Ever run a longish race in the rain? How did you stay dry or warm? I can’t believe that FW is two months old now. Time really does fly! And we’ve been having fun. He’s still small enough for us to take places, but he’s getting more interactive, smiley and fun- it’s great! So naturally, this weekend involved a lot of time out and about with FW. Friday started with lunch with some lady friends at a new Chipotle-ordering type Mediterranean place, Raving Med. I got a turkey shawarma bowl with tons of toppings that sooo good. I love anything with good pita and baba! Friday night was gorgeous so we took a walk and grabbed a drink on Public Square. And then ordered pizza takeout. While we waited, we hung out outside on the patio of Platform. Saturday morning started with a run. It was hot, but the three of us went to the park to try out the running stroller on a smooth path. 5k later …we were sweaty! The park is next to the water and beach- should’ve brought bathing suits! That afternoon was my Ladies Craft Beer Society. Our craft was felt stuff- I ended up making a crinkly felt carrot for FW. Sunday morning started somewhat early with a 5k downtown. It was my first race after FW was born and I decided just to run for fun with my friend Cuoghi. And her dog, Fred. Fred di great and it was fun having a furry running buddy for Sunday morning’s event! And that was about it! A great great weekend here – I hope you had a great weekend! And today, I’m linking up with Erin, Katie and the weekly wraps. Did you spend time outside this weekend? We finally got a break in the heat and it was great! Did you watch the Olympics? What are your favorite events? My first relay is done! This past weekend, I ran the Akron Marathon Relay. I ran with some of my fellow Cleveland Marathon Ambassadors. I’m not going to lie – going into the race, I was pretty nervous. I’d never done a relay before and all the logistics made me uneasy. Where did I start? Did I run with a baton? (a la track and field) What is this slap bracelet I run with? How would I find my other team members? Needless to say, we ROCKED it. B and I decided last minute to spend Friday night in Akron so we wouldn’t have to drive back and forth twice to go to the Expo Friday and race Saturday morning. So Friday late after work, B and I headed down to Akron for the Expo. I love race expos and it was so great to see the famous Blue Line in real life and feel all the amazing energy at the show! We had gotten Flaming Ice Cube for dinner and I had my standard pre-race or long-run meal before we headed to bed. I had a 5:15 a.m. wakeup to get ready for! Saturday morning came quickly, as most people in the hotel were also going to the race. I heard doors opening and closing starting around 4:30 a.m. (the hotel had a shuttle to the start at 5:30 a.m.) and I was able to get up, get race ready, and drink some water and eat part of a bagel. My stomach was acting up, which is unusual for me. I rarely have actual stomach issues, but for some reason this morning my stomach was not liking food OR water. Warning: if you’re not a runner, feel free to not read on. It’s just about running and involves multiple portapotty visits, which, if you’re not a runner (and even if you are a runner) may be TMI. 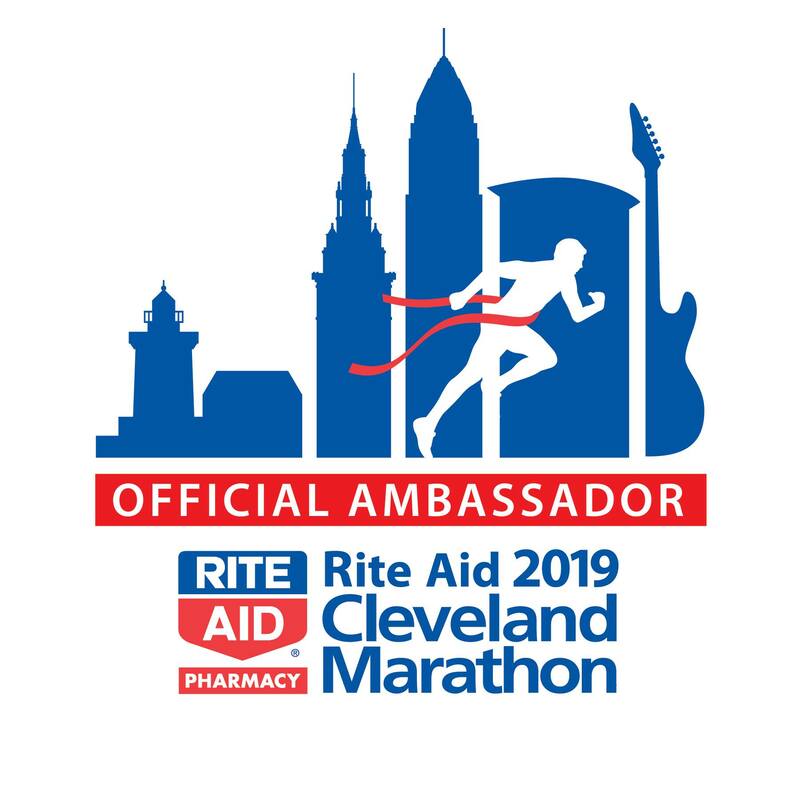 B and I got to the starting line around 6:30 a.m. so I could meet up with some of my fellow Rite Aid Cleveland Marathon Ambassadors. We parked near a McDonald’s and as B grabbed breakfast I had to make bathroom trip #2-3. I couldn’t finish my half of bagel and just really hoped that I would make it another few hours until I had to start. We made it to the starting line and I had enough time to hit up the porta potty Then, we had just enough time to snap a few photos before it was time before it was 7 a.m. and the race began! I was able to find Jill, Dan and Stephanie, but not Andrew, our first relay runner. I was hoping to find him before we started so I could see what he was wearing and we could discuss the bracelet handoff, but alas, he was nowhere to be found. After the start, it was time to make my way to my start. We got to leg #2’s start, a few blocks away, and I knew I had like 35 minutes to kill before Andrew got there. I had enough time to hit up the porta potty line twice and decided that it was not worth it to drink any water. I knew I was dehydrated but figured it wasn’t worth it – I didn’t want to get sick during the race! I waited for Andrew to come and soon they started to call Bib Numbers. Andrew is speedy, and sure enough, I was one of the first runners to be called. I made my way onto the street and grabbed the slap bracelet as Andrew ran up to me. It was go-time! The 5.7 miles I ran are kind of a blur. I know that I wasn’t feeling my best. I was feeling slow, sluggish and slightly dehydrated and woozy (likely from so many bathroom trips). I was running with some of the faster marathoners (Andrew runs a 6:45 min/mile pace, so many of the runners were running about that speed too!) and I was getting passed nearly every second. I started the run on an incline and there were rarely any flat spots. Course elevation – see! No flat spots. I passed a few water and gatorade spots but didn’t want to stop for water because I felt selfish – after all, I wasn’t a marathoner or even half-marathoner, so who was I to stop for water? Also, I worried that I’d feel sick again and I knew I couldn’t let my team down and slow down to stop for the bathroom! Around mile 3, I knew I had to take in some water, so I grabbed a cup and drank a few sips. Sure enough, I started to feel sick again. I knew I just had to make it to the finish. A few hills and miles later, and finally I saw the sign that we were ready for the relay handoff. I got to the point where I was supposed to meet Stephanie (leg #3), and she wasn’t there. I called her name, stopped for maybe half a second, and she appeared! Finally. I was done. I made my way to through the crowd in a daze. I was tired, needed water, and felt discouraged. I felt like I had let my team down – I knew I had been going so much slower than I had expected. All of a sudden, Andrew appeared and gave me a high five and brought me a bottle of water. He was so encouraging and enthusiastic – I was so grateful to see him! I think I may have teared up from relief but also just out of feeling his support. And then I spotted B! He had been watching from across the street and also had water and a hug for me. Again, almost teared up – I felt so emotional for some reason. Just then, Jamie ran by – I was so excited to see her! She is another marathon ambassador and was running the Akron full. She was one of the main reasons we were there as a relay team – to cheer her on! I snapped this photo of Jamie running by at the finish! After that, Andrew and I parted ways – B and I hung out and watched some of the finishers and then it was time to meet up with my fellow ambassadors and wait for the rest of our relay team and Jamie to finish! I made my way to the Finishers Festival on the Rubber Ducks stadium field. I felt much better and was able to enjoy a free beer, a few bites of pizza and had a great reunion with the rest of my ambassadors! It is VERY well run. I mean, I got emails nearly every day the week of the race with every single detail that I may have wanted. This was my first relay so I was pretty nervous, but they pretty much spell it out for you from where to be, what your route is, the elevation profile, how do to the switch from runner #1 to runner #2, etc. There’s info for each leg and once I read through the Leg #2 info, I felt much better. The EXPO was great. Lots of booths, free samples, runners and great energy. my name on the pace car at the Expo! The course had great energy! So much entertainment (I only ran 5.7 miles but I passed at least 4 bands/music stations), cheering (they have an official cheer crew too with blue shirts and cowbells all along the course) and fun crowd support at different points. The volunteers made such a difference! The after-race party. It was so fun to watch all the runners come into the stadium and cheer on the other members of our team. Plus, there was pizza, beer, and other food and refreshments for everyone. My stomach. I woke up in the morning early before the race and my stomach was not happy. Let’s just say that I used the porta potties multiple times before actually starting my leg. I felt a little dehydrated and weak at the start but was super thankful I was only running the relay. I don’t think my body would’ve kept up for much more miles. The hills. My leg started with a slow incline and then I encountered quite a few more hills along the course. Looking at the elevation profile, I may have had it easier than other legs, but it still was rough for me. Especially as I wasn’t feeling optimal to begin with. If I ever decided to run the race outside of the relay, I’d definitely have to do some hill training! All in all, it was a good experience. I’m so glad I did it. I’m not going to lie – I had some reservations about signing up – I had need done a relay before and I didn’t want to let my team down. But they were all so encouraging and helpful! My phone was blowing up with texts the weeks and days leading up to the race, all with such motivating text messages. Also, I ran faster than I expected. My goal was to do sub-9 minute miles, especially since I hadn’t done much training and my stomach wasn’t feeling great. But I got about 8:15 min/mile pace. This was thanks to a few things. First, our first runner, Andrew, ran 6:45 min/miles. Meaning, when I started, I was running with so many of the speedier runners. It sucked at first, because they were all passing me – but I’m sure it made me run faster. That, combined with the fact that my GPS wasn’t working (user error – I had set it on “inside run” mode), made me run faster than I expected, especially given the stomach troubles. Have you ever run a relay? How was it? What event or race should I sign up for next? Have you ever had stomach troubles the morning of a race? What do you do? This Sunday I ran a half marathon, the Inaugural Rock N Roll Hall of Fame Half Marathon. It was the first year of the race (thus the name) and the start and finish line were within walking distance from my apartment. How could I say no? Packet pickup in front of the Rock Hall! Leading up to race week I was less than ecstatic. My left foot was still sore from hiking/rolling it a few weeks ago (whoops!) and the weather was looking HOT. How I spent the night before the race … compression socks (yes, they’re inside out) and ice! That being said, it ended up being a pretty good race! The heat held off until the afternoon (it was low-70s instead of mid-80s!) and my foot only hurt the first few miles. So how else did it go? Now, overall thoughts on the race. The fuel: There were water stops every two miles on the course and TWO fuel packet (Carb boom!) stops. I was able to grab water nearly every stop without a problem AND the people who were volunteering to hand out water were so helpful and cheerful! There weren’t many crowds on the course, but the people handing out water and Carb Boom were great motivation. Thank you! Well-organized: While I didn’t hear from the race folks until the Thursday before the race (and yes, I was a little worried), the packet pickup and race day events went very smooth. The porta potty lines at the start were very quick (always appreciated!!). ended up being a gorgeous day! The course: I know, I said I liked the course above. Forgive me, I’m fickle. I found the last 4 or so miles of the course awful, mentally. It was all one straight away (I do better on courses where there are a few turns I can look forward to), all black top, and no shade. Thank goodness it didn’t hit 80s until later in the day, but I was hot and bored. The crowds: There weren’t many people out watching during the race. I know this isn’t the fault of the race organizers, but it would’ve been nice to have more people watching and cheering us on. I am so grateful that B and Nicole were out at 2 spots plus the finish line cheering us on! Nicole made us a sign! Race entertainment: I was hoping for a band along the course or something – but besides the water stops (which, as I said above, were plentiful and cheerful! ), there was nothing. And I’m spoiled with bands and music and cheering from other races, so I missed that during this course. I don’t have another half marathon in my sights anytime soon – I’m tooling with a November race, but haven’t signed up yet. After feeling ill the last few miles, it’s hard to get myself to register. It took me some time to be able to eat normal food again. post-race fuel. My fave acai bowl at Restore! What is the last race you PR’d in? What’s next in your sights? Do you feel sick during long runs? What’s the cause/cure?